Secrets can be toxic—kept too long, they can destroy a person or a whole community, as evinced in this Southern coming-of-age novel by first-time author Matt Matthews. Sixteen-year-old Isaac Lawson is still reeling from the death of his mother less than one year earlier. His father is the local pastor and is well respected in their small town on the Eastern Shore of Virginia. Rather than his usual summer spent playing baseball, Isaac has decided to work at a local hardware store. It isn’t long before a string of unusual break-ins begin occurring in the sleepy town. Someone has been flooding homes and drawing pictures of flames on the walls. At first, Isaac becomes interested in the investigation for the $5,000 reward offered by a local community organization. Eventually, though, he comes to suspect that the homes that have been targeted are not random, but instead have something to do with a long-ago wrong that was perpetrated on one of the citizens. Isaac’s curiosity is piqued, almost to the point of obsession, as he spends the summer investigating the connection between the break-ins and the town’s shameful past. The author introduces interesting characters, never resorting to stereotypes. Isaac works alongside Eddie, who the town has labeled “Crazy Eddie” because of his unusual mannerisms. There is the half-lucid elderly woman, Mattie Thomson, who may have given Isaac the key to uncovering the town’s secrets. And there is Hank Grady, the ringleader of the elderly men who sit around the hardware store, day after day, alluding to a sinister aspect of his own character. Isaac grows as a person throughout the book—he comes to see his widowed father in a new light, accepting his right to move forward; he also comes to realize that adults are not perfect, and, while they need to be held accountable for their actions, they should sometimes be forgiven. 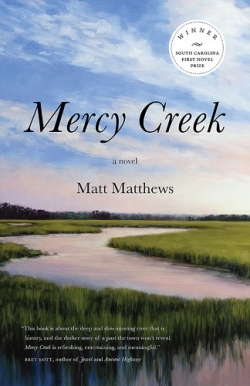 Mercy Creek, a thought provoking read, is the deserving recipient of the South Carolina Prize for First Novel.